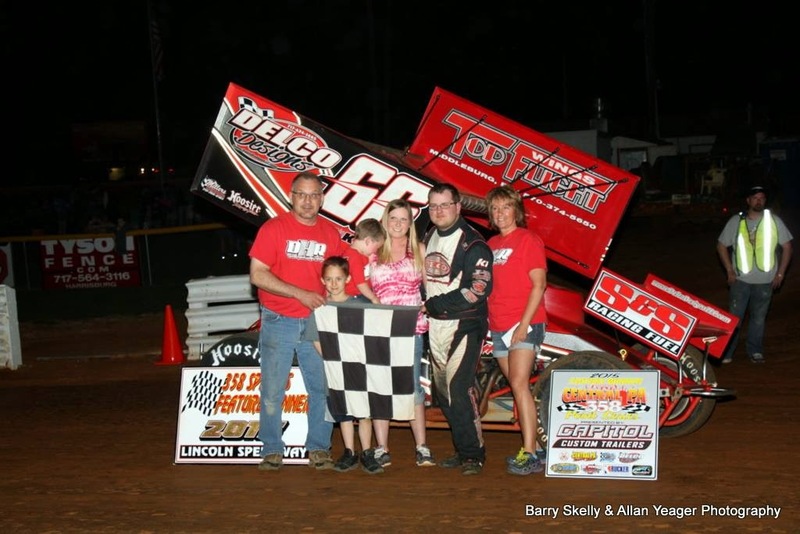 ABBOTTSTOWN, PA, 4/18/2015 – Score one for the little guys in Saturday night’s thriller at Lincoln Speedway. Race winner Glenndon Forsythe with his family in Victory Lane. Glenndon Forsythe started on the pole and claimed his first Lincoln win in more than a year (8/13/13). But he didn’t lead every lap, as four cars were still in the hunt when the event’s only caution came out as the leaders headed into turns three and four on the last lap. Forsythe led the first 18 non-stop laps before sixth-starting Austin Hogue, driving the other Livingston Lawn Car sprinter, raced down the York racer exiting turn four in heavy lapped traffic on lap 19. Hogue led the next two laps, but couldn’t get away from Forsythe, who reclaimed the lead exiting turn two of lap 22. As those two raced for the lead, outside front row starter Mike Bittinger and ninth-starting Alan Krimes entered the battle, with all four cars still in the hunt when the event’s only caution came out for a slowing Billy Dietrich just in front the leaders in turn four. Forsythe withstood the final one-lap dash to the checkered, crossing just in front of Hogue, with a hard-charging Jim Siegel catching both Krimes and Bittinger for third on the final lap. Bittinger and Krimes finished fourth and fifth. Rounding out the top ten were 12th-starting Lance Dewease, 11th-starting Brian Montieth, Adam Wilt, Cory Haas, and Kyle Moody. Heats for the 32 410 Sprinters were won by Wilt, Krimes, Siegel, and Moody, with Brandon Rahmer winning the consolation. Freddie Rahmer was uninjured in a heat race flip that saw him bicycle and crash hard into the fourth turn wall. The car was done for the night. Doug Hammaker celebrating a hard fought win with his mother and his dad "The Godfather" as well as his lovely wife and son. 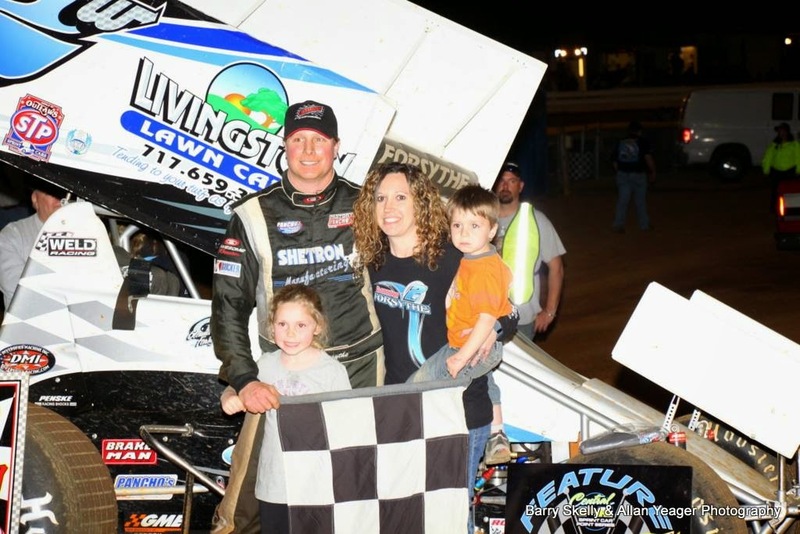 Carlisle’s Doug Hammaker held onto his Central PA point series lead by claiming his second Lincoln career win in the 20-lap 358 sprint car feature. Hammaker started third and took the lead from lady driver Ashley Cappetta on lap five. Cappetta actually led the first four laps, but a slowly-deflating left rear tire forced her to stop while running fourth with three laps to go. Once in front, Hammaker led the rest of the way, despite the challenges of bottom-feeder Jeff Rohrbaugh and 11th-starting rim-riding Kevin Nouse over the latter stages of the race. Hammaker’s final margin of victory was .38 seconds. Crossing fourth and fifth were opening night winner Todd Rittenhouse, Jr. and Friday night Trail-Way winner Isaac Sneeringer. Sixth through tenth were 13th-staring Adrian Shaffer, 12th-starting Matt Campbell, Chandler Leiby, 16th-starting Cody Fletcher, and polesitter Kyle Denmyer. Heats for the 37 358 Sprinters were won by Ryan Wilson, Rohrbaugh, Todd Reed, and Nouse, with Matt Findley winning the consolation. Kyle Martin received a tire rub from good buddy Brian Walls while crossing the finish line to win the 20-lap street stock feature. The two leaders got caught up by a lapped car while racing for the win at the line, with Walls settling for second. Third through fifth were Ryan Smith, early race leader Chris Derr, and 11th-starting Dustin Hollinger. Heats for the 24 Street Stocks were won by Martin, Brian Walls, and Jason Gessaman. Next Saturday night, April 25th, it is YORK COUNTY RACING CLUB (YCRC) NIGHT with all card-carry members receiving $2 off general admission. The 410 Sprints and 358 Sprints will be joined by the Central PA Legends in the 3-division show. Race time is 7 PM, with gates opening at 5 PM and hot laps getting underway at 6:30 PM.